12-fluid ounce pump bottle of liquid facial cleanser Helps clean, moisturize, and protect Removes excess oil, dirt, and makeup For sensitive skin, including acne, eczema, and rosacea Skin nourishing polyglycerin formula leaves skin soft Contains no fragrance, soap, dyes, parabens, or sls From a dermatologist recommended brand Hypoallergenic and oil-free Clean, and leave skin feeling moisturized, in one step with Neutrogena Ultra Gentle Hydrating Cleanser. 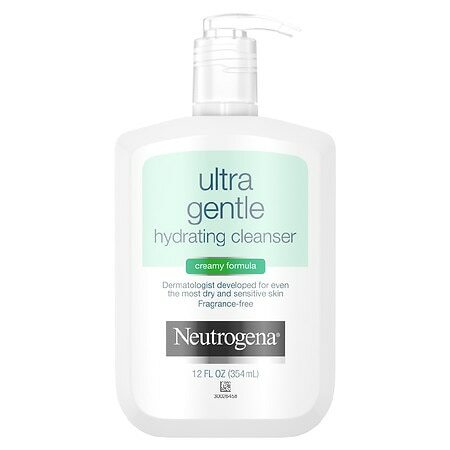 This effective, yet extraordinarily mild cleanser leaves skin feeling hydrated as it cleanses. Dermatologist developed for even the most sensitive skin and skin conditions, including acne, eczema and rosacea, this gentle cleanser effectively cleanses by removing excess oil, dirt, and makeup to leave skin clean and feeling moisturized. The cleanser features a skin nourishing polyglycerin formula that helps protect skin. It is hypoallergenic, non-comedogenic, and free of ingredients that can irritate skin including fragrance, soap, dyes, parabens, and SLS. How similar is Brian King's skin with yours? Take the Skin Assessment to find out how similar you are and find your SkinTwins. How similar is Ruthney's skin with yours? Take the Skin Assessment to find out how similar you are and find your SkinTwins.